The Six Foot Track is one of Australia’s classic long-distance walks. Set in the World-heritage listed Blue Mountains region, experience the challenge of this 44-kilometre long trek as you journey down dramatic escarpments, across wide rivers and through remote bushland. This book uses a delightfully quirky and original format. 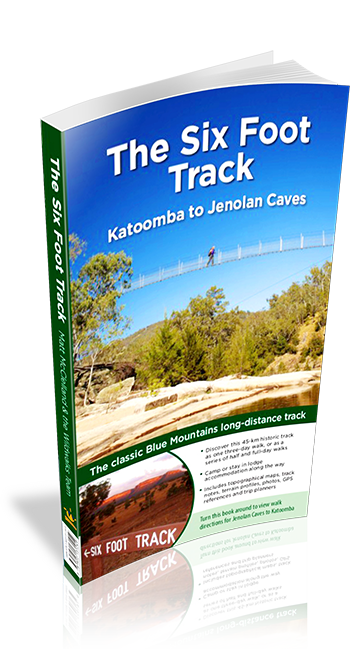 The first half of the book presents walk directions running from Katoomba to Jenolan Caves. Turn the book upside down, and you can read walk directions running from Jenolan Caves to Katoomba. Navigation and trip planning are made easy with full-colour maps and detailed walk statistics, including distance, total ascent and descent, walk grades and estimated times. The Six Foot Track also includes lots of information about the flora and fauna of the area, as well as local history and points of interest. Read about the construction of the suspension bridge over the Coxs River, find out about activities around Jenolan Caves or discover the story of the people who built this track more than 100 years ago. Full-colour photos highlight key attractions along the way. The Six Foot Track can be done in a blitz as a marathon run in a single day, as a challenging two-day hike, or as a more relaxed three-day walk. This book outlines the logistics of all three of these options, including details about accommodation along the way, public transport at either end of the way, and what you’ll need to take with you to ensure a safe and comfortable adventure.